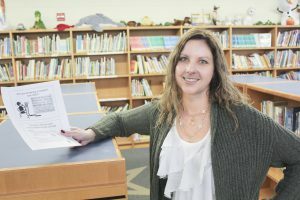 Kate Steele is an Adrian middle school technology teacher with a master’s degree, but she rang up a lot of student loan debt to get there—and like many educators, she has struggled to make huge monthly payments on a teacher’s salary. Kate Steele, a technology teacher in Adrian, has found some relief from burdensome student loan debt by learning more about federal loan forgiveness programs and income-driven repayment plans. She expects to be debt free in seven years. With $104,000 in loan debt, Steele was shelling out $534.53 a month for seven years—that’s nearly $45,000—and she still owed $101,000 at the end of that time. Steele was a young single mother and first-generation college student when she began pursuing a degree 22 years ago. Then she heard about the Public Service Loan Forgiveness (PSLF) program. Since then, Steele has been able to cut her monthly payment nearly in half—to $287.63—and she looks forward to the remaining debt total being forgiven seven years from now. She estimates a balance of more than $63,000 will disappear then, not including interest. Now MEA is helping more members accomplish what Steele has done. A new training cadre is traveling the state to make members aware of the PSLF program (among other, smaller forgiveness opportunities), which promises to erase student loan debt for school employees who work in public schools for 10 years while making qualifying payments. “We’re getting really good member turnout at these meetings, and people are highly engaged because this affects their lives and families,” said Kevin Marvin, an MEA UniServ director who is a trainer in the cadre. Lesson number one that training participants learn: Don’t wait until you hit the 10-year mark to begin applying for the program. The reason is two-fold, Marvin said. The second reason to start the application process sooner rather than later involves the fine print of the program’s rules. “Qualifying payments” and “eligibility requirements” can trip up some public school employees who think they’re on track for forgiveness. The MEA trainers also want to steer members away from predatory companies that offer to help people navigate the PSLF process for huge fees. Some of these businesses advertise that they will complete the application process at a cost of $1,500 or more. Even worse, Marvin said he heard from a member in one training who paid money and gave her Social Security number to a fake company that disappeared and never processed her paperwork. “It’s sad and scary—I’ve heard these stories from too many members,” Marvin said. Kate Steele of Adrian fell into one of the traps Marvin warns about. For technical reasons, her first seven years of loan payments did not qualify for the program. That meant she had to address issues and start over with a new clock. She’s now three years in toward the 10-year forgiveness. But Steele narrowly avoided another common pitfall after hearing an advertisement on the radio for loan forgiveness help. When she called for information, the salesperson wanted her to pay $500 to sign up and $50 a month for the next 10 years to guide her through the process. “I almost signed up; it was so enticing, but it would have cost me $6,500 for something that it seemed like I could do for myself,” said Steele, who learned so much through research that she started doing trainings locally before MEA offered sessions statewide. Armed with information, anyone can handle the PSLF application on their own, according to Marvin. In fact, the MEA training shows participants how to handle the process themselves, including yearly resubmissions of paperwork. The Public Service Loan Forgiveness program initially passed Congress in 2007, so the first recipients began to pass the 10-year mark last October, Marvin said. Any members interested in learning more can contact their local UniServ field office to schedule a session with the cadre. “Honestly, doing this training has been one of the most rewarding things I’ve been involved in,” Marvin said. If you’re an employee of a public school, college, or university who is drowning in student loan debt and struggling with monthly payments—talk with your local UniServ director to see about scheduling MEA’s new Loan Forgiveness training in your area! What dates and location do you have available for student debt meetings. I am interested. Please contact the MEA Help Center at help@me.org, call 866-MEA-HELP, or use the live chat feature on our website or app. Our Help Center representatives will be able to assist you with this matter.